Worship leaders are adrift in a sea of worship resources, but, incredibly, no single book provides a simple introduction to worship and worship leading. Essential Worship is a concise, easy-to-read primer on the basics of worship theology and practice. Each concept is introduced clearly and concisely. Diagrams, charts, and bulleted lists make the information easy to digest. And preparation and reflection questions help readers apply the material to their own church context. Whether one is a beginner or an experienced worship leader, readers from all traditions will find in this resource a solid foundation for future success. It is particularly well-suited for the first-time worship or praise band leader, as well as for pastors who want to be more intentional about the music in their services. 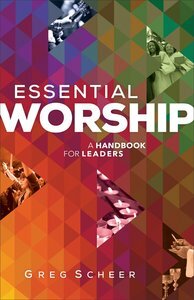 About "Essential Worship: A Handbook For Leaders"
Greg Scheer (M.A., University of Pittsburgh) is a composer, church musician, and choir and music director who has served in several churches. He was director of music ministries and a professor at Northwestern College (Iowa) for five years. Scheer is currently minister of worship at Church of the Servant (CRC) and a music associate with the Calvin Institute of Christian Worship, both in Grand Rapids, Michigan.